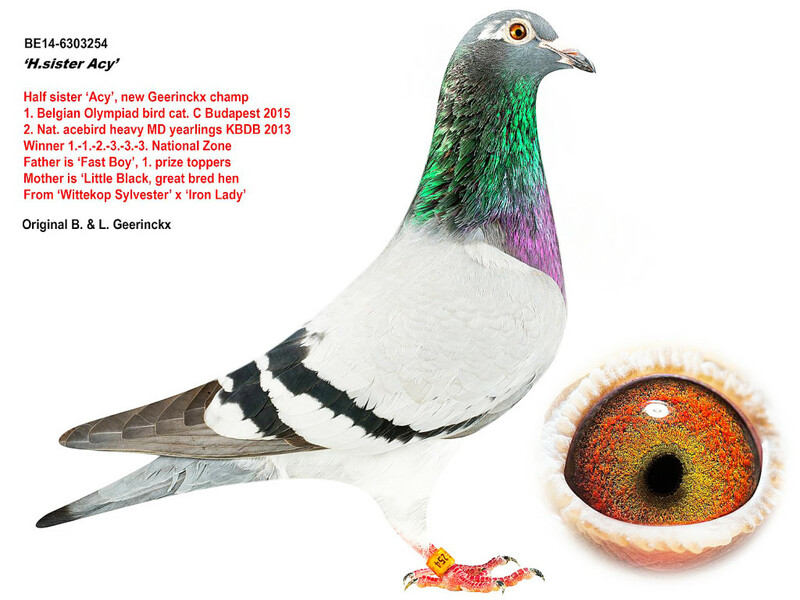 HALF-SISTER "ACY", 2nd NATIONAL ACE PIGEON KBDB 2013, B12-6042457, 1st OLYMPIC PIGEON LONG DISTANCE 2015, 500 +KM, WINNING : 1ST NATIONAL ZONE BOURGES 2014 3.750 BIRDS, 8TH NATIONAL 22.663 BIRDS, 1ST NATIONAL ZONE CHATEAUROUX 865 BIRDS, 11TH NATIONAL 6.005 BIRDS, 2ND NATIONAL ZONE MONTLUCON 2013, 3.721 BIRDS, 3RD NATIONAL ZONE ARGENTON 3.519 BIRDS, 3RD NATIONAL ZONE TULLE 2014, 1.817 BIRDS, 9TH NATIONAL 5.976 BIRDS, 3RD NATIONAL ZONE ARGENTON II 832 BIRDS, 110 NATIONAL 6.801 BIRDS, 4TH NATIONAL ZONE MONTLUCON 2.162 BIRDS, 52ND NATIONAL 14.230 BIRDS !! 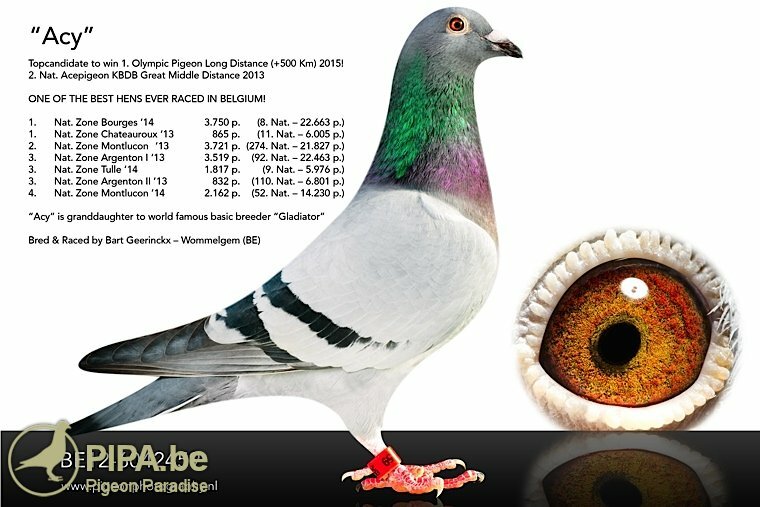 Sire is B07-6229105, FAST BOY, topracer, 1st Noyon 420 birds, ( fastest provincial) 11th Orleans 4.281 birds, 53rd La Souteraine 4.459 birds, 82nd Argenton 9.901 birds, 200 National Bourges 22.476 birds, 250th National Bourges 11.756 birds, fabulous producer, bred from B04-2298053, RAPIDO I and B04-6202174, WITPEN BOURGSKE, the cream of the Geerinckx family ! Sire of "ACY" ! Dam is B10-6357739, "LITTLE BLACK", HALF-SISTER of LITTLE STAR, 1st National Ace Pigeon Great Middle Distance 2015 KBDB, daughter of the no.1 producer of the Geerinckx family, famous B02-6354241, WITTEKOP SYLVESTER, sire of the loft L.B.J. Geerinckx son of B95-6279487 ZWARTE SLAETS, grandson Panter and B94-6366938, Wittekop Pootje, daughter Grote Witte, 4x 1st from the supers of Jos Soontjes. 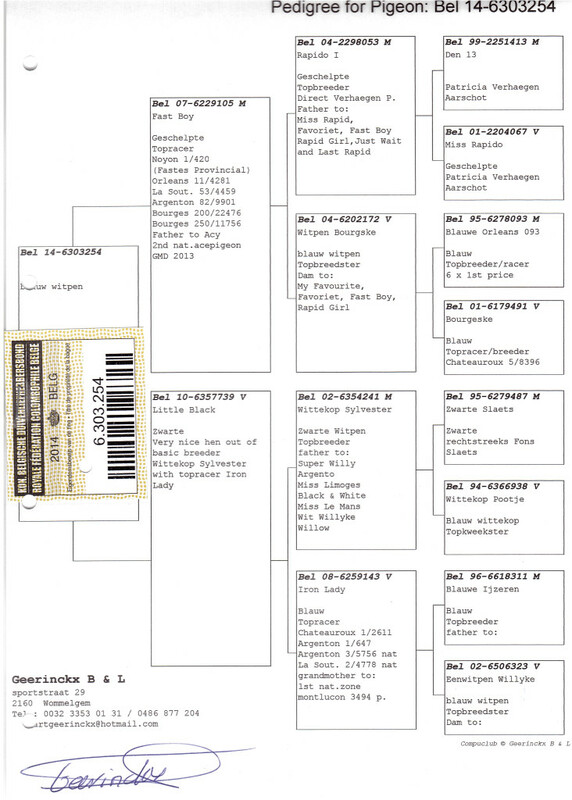 Her dam B08-6259143, IRON LADY, 1st Chateauroux 2.611 birds, 1st Argenton 647 birds, 3rd National Argenton 5.756 birds, 2nd National La Souteraine 4.778 birds, fantastic producer and daughter of B96-6618311, BLAUWE IJZEREN and B02-6506323, EENWITPEN WILLYKE, foundation hen and the mother of LITTLE STAR !! !